Oval Address Sign with Lights -- Two light bulb styles available: standard 3-watt incandescent bulbs or brighter, energy-efficient LEDs that last longer and use less power than incandescent bulbs. Illuminated home address plaque can be seen from 100 feet away, making it easy for guests, delivery trucks, and emergency vehicles to find your home. Durable cast aluminum construction won't rust, rot or crack, ensuring years of quality service. Select from French bronze, oil rub bronze, antique copper, black, and pewter. 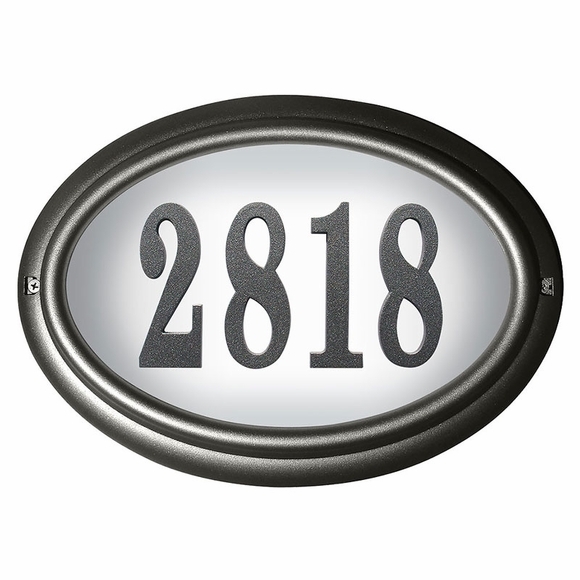 Holds up to five 4" vinyl or cast aluminum numbers. Dimensions (approximate): 10.5"W x 2"D x 14.5"L.